Getting out and about with a little baby can be difficult at times, but knowing you have everything you need at your fingertips sure makes it a lot easier. The Baby Bundle is the first offering from Bella Buttercup, aimed at mums who want a bit of luxury in their everyday necessities. It’s really somewhere between a nappy bag and a simple portable change mat. The Bundle contains everything you need for changing your baby on the go, or out of your home environment, and nothing that you don’t. The Bundle opens out into a portable change mat, but also contains pockets for storage. The whole thing (including the change mat) is made from cotton fabric (with waterproof lining) so it’s lovely and comfortable for your baby, but also machine washable. A blanket and twin changing mats complete the set. 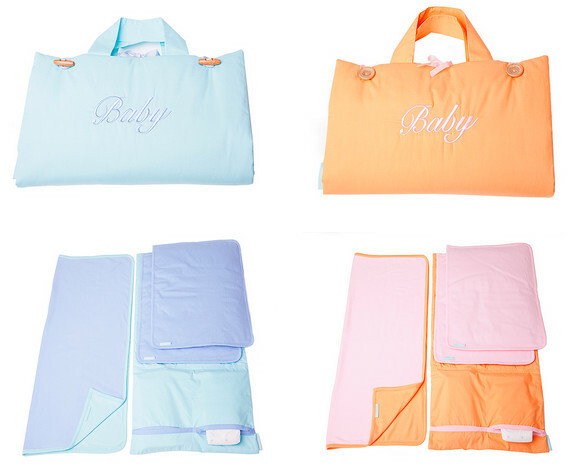 The Bundle comes in four colours and would be great to keep in the car, or even in the lounge room for easy changes if you have the kind of baby who hates the change table and keeps trying to roll off it! Find the Baby Bundle at Down that Little Lane for $89.